Whatever your reason for your structural survey, we would be delighted to talk about your requirements. Our approach is to initially understand your requirement for a structural survey. Thereafter, we would visit your property/building to undertake the structural survey. As part of this process we will photograph all elevations and key rooms, whether they show signs of distress or not. On completion of the structural survey, we give you a verbal heads up on any issues that there may be or indeed may not be. All our reports are clearly written to accurately record our observations and give our conclusions/recommendations. 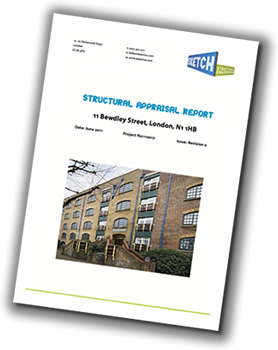 Please do read our Sketch News item – Structural Surveys.